Wife had her first teaching class today, so I woke up to an empty house for once. The boys had gone to school earlier in the day. My job for the day was simple – to jaga (guard, or look over) them when they were home about lunch time, and to make sure they were fed. My wife would be home shortly after that. 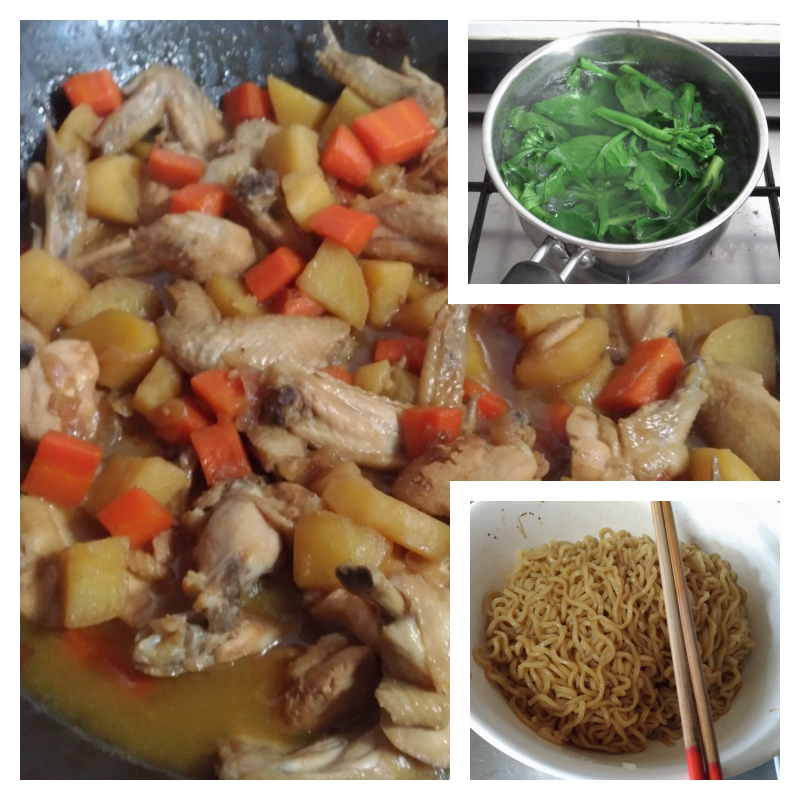 Somehow, I decided to cook instead of buying lunch. This was partly selfish – I really couldn’t think of what to eat, as everything I could think of nearby was either too salty, too sweet or too bland for my liking. I also wanted to push myself to overcome my problem with the overcooked egg the day before. I decided to go to the wet market instead of the supermarket, as I didn’t have time to defrost frozen chicken, and what I had in mind was better done with chicken wings. When I reached the market, the auntie still had fresh chicken wings left, with 10 in each pack, for $6.50 each. On the spur of the moment, 10 felt too little and 20 felt… ambitious. I decided on 20, and also decided to plan to cook a portion big enough for dinner as well. 4 potatoes, 3 carrots and one onion were duly purchased, before I returned to auntie as I’d asked her to help me separate the wings into drumlets and mid-joint wings with tips. I also managed to get $2 worth of ikan bilis. I then stopped by the supermarket and managed to get a really fresh bag of baby kailan, a couple of packets of tofu (1 for lunch, and 1 for dinner), and then I was ready to cook. I also got a couple of packets of Sabah instant mee. Embarassingly… I have no idea how to use our rice cooker, so I decided to take this short cut. Plus I’ve been dying to find an excuse to try this noodle brand. So… I am rather proud to say that I managed to cook a proper full meal! Oyster sauce chicken, potatoes and carrots, with enough sauce to call this a stew. The onions had been caramelised into the sauce to the point of vanishing! Instant noodles as the carb, baby kailan boiled in ikan bilis soup, which was then used to cook tofu and served. I struggle to find things to be proud of still, especially as I’m still not working. 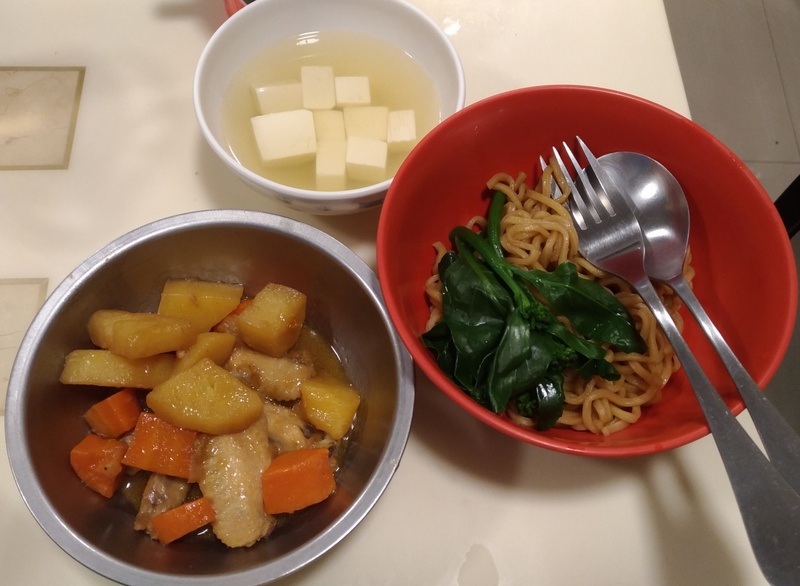 I was very nervous just before the boys came home, wondering if they’d complain about the food, and also worried about how the noodles would be received. Side note – the Sabah noodles are amazingly good. Quite Q (bouncy, chewy) even after I’d left it out for some time, with no clumping or increased sogginess, which is really nice! And the flavouring also wasn’t too salty though we’re having rice for dinner instead, as I’d prefer not to have instant noodles for two meals running. Sheng Siong sells them, as well as the Qoo10 site I linked to earlier. I also decided to make sure the boys had reason to eat well by portioning their food nicely. More than enough for a growing boy!… As it turned out, it really was too much food. Sigh. I’m glad to say that the boys ate well, even if there was too much food, and they declared that they wanted the sauce on rice for dinner. Which means just adding a bit of water, bringing the stew to a boil, and then scooping it out on their rice later. I managed to force myself to focus on one task at a time. If other tasks screamed for attention, I forced myself to ignore them, such as by turning off the fire on that particular item, or leaving something half washed to stir fry the chicken. I no longer believe I can multitask well, so I refuse to. That way, I managed to do everything relatively well, even if it took a longer time. Besides, I finished about 15 minutes before the boys came home, so that means I managed my time well enough. I was nervous about how the food would be received by my wife and kids. I think I’d be rather upset if they didn’t like it, even if I liked what I cooked. Our best friend gently reminded me that it’s ok to want the acceptance and approbation of our loved ones, so I guess it was ok for me to feel nervous. I’ve done something I’m actually proud of. 🙂 And I’m not going to say much more about that, which to me is progress. I shall not make excuses for doing a good job. That sounds funny but that’s the reality I’m fighting. I’m also very aware of myself and my emotions. My wife arrived home, just as I was about to crash. Unwisely perhaps, I’d mopped the floor of the kitchen and living room and dining room, because I felt the kitchen floor was a bit oily after cooking. My energy crashed out shortly after the boys came home, and my wife’s return was a huge relief. But I could articulate my problem, and she was glad to take over, and enjoyed the food as much as I’d hoped. I allowed myself a slow recovery, and had my lunch later than everyone, but still feeling rather happy that I’d done well enough. This last point is probably the reality for the next few months, as I continue to keep up hypervigilance of myself, without judging whether I have good or bad emotions etc. I have accepted that this is the new me. But my stubborn side insists on fighting hard with God’s help, even to the point of exhaustion – but with myself now better prepared for recovery. But hor. I don’t intend to cook again for the next week or so. Even if I feel proud of what I’ve done, I feel tired just thinking about it.